A unique site of industrial heritage replaced by bland showpiece architecture. 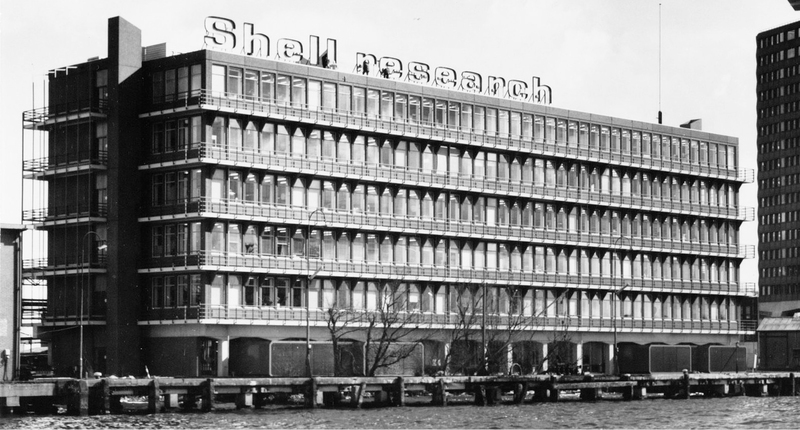 In 1999, Shell decided to leave most of its premises in Amsterdam-North. While the redevelopment plan encouraged a mixture of functions, the inclusion of the area's aged buildings was rejected. Capital ebbs and flows, as rivers do. The same way industry found its way to the northern bank of the IJ at the end of the 19th century, it started moving away at the end of the 20th century. In 1999, the Shell laboratory decided to free a large part of its terrain in Amsterdam-North, enabling the urban redevelopment of this centrally located area. While the mixture of functions is usually encouraged in urban regeneration projects, the inclusion of aged buildings is often rejected, clashing as it does with the interests of a capitalist economic system. As many other redevelopment projects, the former Shell-terrain fell victim to the increased visual importance of its privileged location, and so its industrial heritage was rapidly erased to give way to a new luxury neighbourhood. 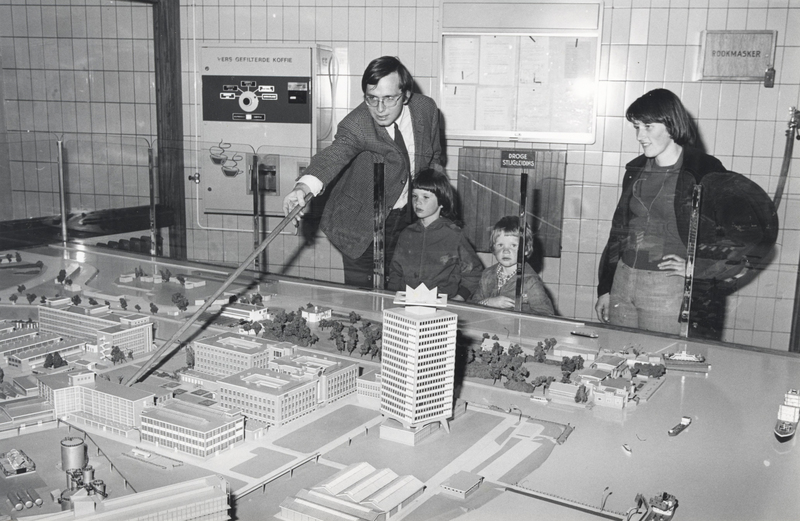 A Shell employee shows a scale model of the Shell terrain to his family in the early 1970s. Amsterdam-North has always been known as Amsterdam’s backyard, conveniently separated from the city centre by the river IJ and yet sufficiently close to be fitting for an array of unpleasant, peripheral urban functions, amongst others a gallows field and polluting industry. 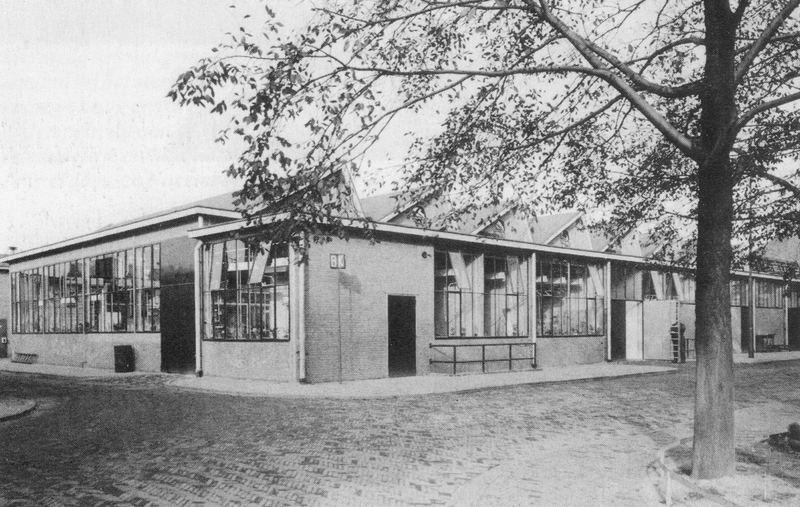 Paradoxically, at the beginning of the 20th century, the district came into vogue as the stage of progressive recreational events, such as open-air music concerts and dance parties at the Toll House (Tolhuis), the First Dutch Exhibition in Shipping Technology (ENTOS) and the First Aviation Exhibition Amsterdam (ELTA). The industrialisation of the riverbank led to the gradual construction of workers housing at the district’s core. After the Second World War, the lack of suitable building ground elsewhere intensified urban sprawl, subsequently turning North into Amsterdam’s largest district when measured in square kilometres. Yet, the area remained persistently one of the poorest of the city, lacking social diversity, cultural facilities and other amenities, even after the construction of two bridges and two tunnels for automobile traffic. Besides, without a convenient pedestrian and bicycle connection crossing the IJ, the district’s population still had to rely on the ferryboat to travel back and forth to the city centre. While Amsterdam North has been called the city’s ugly duckling, its relative isolation contributed to a strong identity and sense of community, proudly rooted in its working class traditions. The former Shell terrain as seen from the city centre, with the Overhoeks Tower and the new EYE Filmmuseum. In 1914, the zoning of the northern bank of the IJ for industry allowed Shell to set up a laboratory in a privileged spot on the waterfront, just across the Central Station and city centre. What is more, it gave the company the opportunity to expand until they owned a total of 27 hectares of ground, including the Toll House Garden (Tolhuistuin), once a public facility. To define the site’s spatial and functional structure, the company chose to frequently work with the same architects, in particular Kees Abspoel and Arthur Staal, who are responsible, respectively, for buildings dating from the interbellum and post-war periods. Kees Abspoel (1899‐70) was the company architect from 1924, and was responsible for the vast majority of Shell’s pre-war structures. Most notably, he designed a monumental string of buildings alongside the Buiksloter Canal, and a few smaller edifices amongst the greenery of the Toll House Garden. 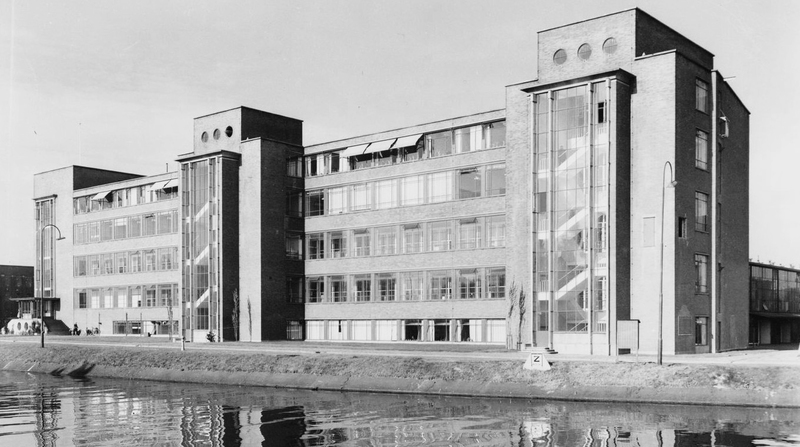 After the war, the Shell laboratory developed into an extremely wealthy and prestigious research facility, and when local authorities sought to change the contour of the river IJ, the company grabbed the unexpected opportunity to ‘redo’ its façade on the waterfront, using architecture as a means of corporate self-representation. While Abspoel had delivered an essentially functional but nonetheless contextual architecture, the younger Staal (1907‐93) brought disruption and spectacle to the industrial northern bank with iconic buildings such as the IJ Lab, the Overhoeks Tower and the company restaurant. Workshop with saw-tooth roof, presumably designed by Kees Abspoel, 1936-38. Development Lab, Kees Abspoel, 1940. Throughout the 1970s, as Amsterdam’s port moved downriver, the gradual deactivation of the central and eastern harbours resulted in large swaths of industrial wasteland on both sides of the river IJ, plus a waterfront virtually devoid of public functions and spaces. At the beginning of the 1980s, Amsterdam, like many other ‘post-industrial’ European cities, was toying with the idea of reconnecting with its riversides while using waterfront redevelopment as a medium to revitalise its inner city. The ensuing regeneration of the banks of the IJ, which is still in progress, is the city’s largest and most important urban transformation process in recent times. During the 1990s, while the regeneration of the southern bank became tangible, Amsterdam North was still seen as ‘the other side’. The turning point came in 1999, when Shell decided to move to a new facility on the north-west end of the site, freeing 20 of the 27 hectares formerly occupied. This move would not only make the long-desired urban redevelopment of this central area possible, but triggered the wider regeneration of the entire northern bank. Indeed, local authorities promptly acquired the newly available ground and commissioned the Master Plan for the Northern Bank of the IJ, including a cultural-historical impact report (CHER). Even today, the two banks of the river IJ have fundamentally distinct identities. While the southern bank became strongly metropolitan due to its proximity to the city centre, the northern bank borders the garden villages of Oostzaan, Buiksloot and Nieuwendam, and connects with nature further away. Moreover, the northern bank still has operating industry, although currently shifting towards more office-based (creative) businesses. The municipality hopes to further develop it into a different kind of urbanity, with a visible industrial but also green character. Hence, the master plan for the northern bank relies on a gradual and flexible transformation process within a coherent network of roads, green and water, and without a previously set blueprint. 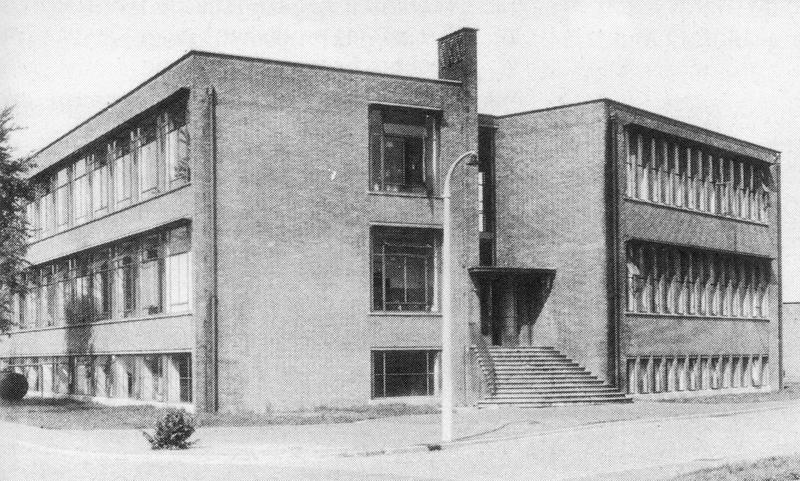 New Lab, Kees Abspoel, 1939-51. Technical Services building, Arthur Staal, 1959. In spite of the knowledge that longer transformation processes result in better quality neighbourhoods, which profit from specific qualities bound to social, formal and spatial characteristics, the local authorities opted for a fast-paced – nearly tabula rasa – approach for the former Shell terrain. The privileged location of the site in relation to the city centre combined with the new visuality of the waterfront made it extremely valuable for the introduction of housing and other urban functions, as well as to act as a catalyst for the more gradual transformation process envisaged for the northern bank. In fact, the site’s renewed centrality had the potential to attract new residents, visitors and businesses alike. In 2003, the local authorities formed a public-private partnership with ING Real Estate Development (ING RED) to act as the site’s single developer. Together they commissioned the Urban Design Plan Shell terrain (2004), which maximises the available ground with a high-density building program of which 70 percent is reserved for housing (circa 2,200 units) and 30 percent for other urban functions. Disregarding the recommendations of the CHER report concerning the cultural and historical value of some of the existing buildings, the plan sketched a situation in which the industrial past was practically erased – with the exception of a few noteworthy buildings clustered on the southwest end of the Buiksloter canal – to give way to a brand new neighbourhood. The arguments used to justify the demolitions were that many of the former industrial buildings could only be transformed into housing at a high cost, while their unmodified preservation would make it impossible to achieve the ambitious housing program aimed at luring in Amsterdam’s middle and upper classes. 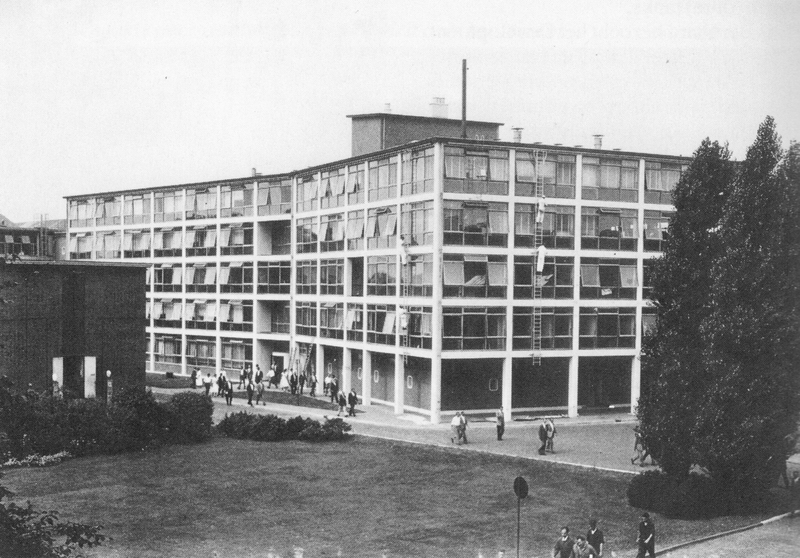 IJ Lab, Arthur Staal, 1969. The new neighbourhood was named Overhoeks after Staal’s charismatic tower, one of the few buildings to survive demolition, and was designed as four distinct areas: the residential Campus on the northern side of the terrain, the mixed-use Strip on the southern side, the Schegpark in the middle and the Oeverpark on the west, the latter providing a long desired promenade alongside the river IJ. Although Overhoeks is being marketed as a mixed-use neighbourhood, its largest section, the Campus, is not only insipidly mono-functional but also socially exclusive as it aims blatantly at higher-income groups, with large apartment buildings placed in such a manner as to enclose luxury private courtyards separated from the public space by uniform fences and gates. In contrast, the Overhoeks Tower was transformed into A’DAM Toren, a multifunctional cultural hot spot with a rooftop observation deck that will forefront a bold line of tall buildings labelled the Strip, set to become a busy part of Amsterdam with a mix of trendy apartments, offices, schools, restaurants and several hotels. Following a strategy popularised by Bilbao in the 1990s, when the Basque government commissioned an offshoot of the Guggenheim Museum as ‘anchor’ attraction to lead the urban regeneration of the city’s decaying port area, the intersection point between the Schegpark and the Oeverpark was reserved for the construction of a similarly high-profile cultural institution. At the time, the Filmmuseum Amsterdam was struggling to find a new location, and it teamed up with the local authorities and ING RED to commission a new venue in Overhoeks. The move from the museum’s existing pavilion in the Vondelpark to the still largely disregarded North was both risky and visionary, and all the involved parties understood the importance of a spectacular building – the type of building that works in media reproductions and is capable of drawing in large amounts of visitors. Their collective effort resulted in the sculptural EYE Filmmuseum by Delugan Meissl Architects, which opened in 2012 to great success, becoming at once a new cultural and architectural landmark. The museum’s name is both a pun with the Dutch pronunciation of IJ[read ‘eye’] and a reference to the cinematic experience, embodying thus specificities of place and of building function. But more than that, the name also ironically sums up the deliberate transformation of the waterfront into a site of ‘spectatorship’, a process which derives financial gain from the stunning view and the area’s increasingly attractive image, leading to inflated land values, class transition and the unfortunate demolition of less glamorous industrial heritage. 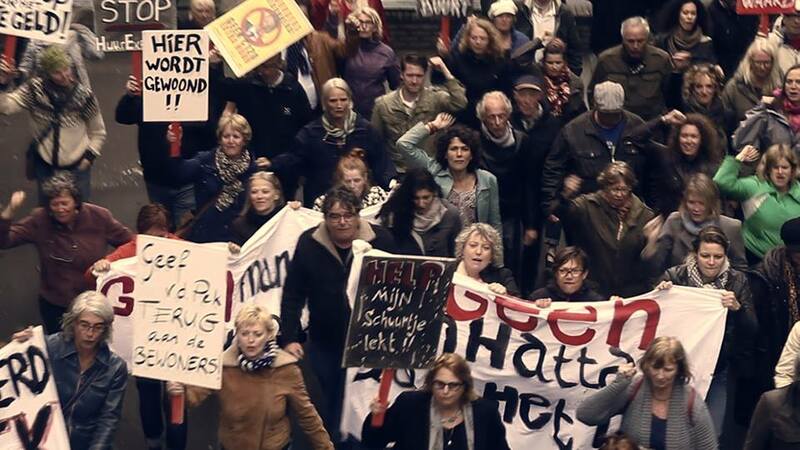 In 2016, residents participated in ‘Volksopera Van der Pek’, mockingly protesting local gentrification tendencies. Overhoeks was conceived as an instant extension of the inner city. Its growing popularity is leading to rapidly changing demographics in the district and huge pressure on the ferryboat services across the IJ. In 2014, the situation was dramatic enough to inspire the directors of the EYE Filmmuseum, the Tolhuistuin and the A’DAM Toren to publicly plea for a bridge, forcing the municipality to realize that connections for cyclists and pedestrians needed urgent improvement. In early 2017, after passionate discussions, the municipality announced a set of measures to be implemented until 2025, including the construction of a bridge between Java Island and Amsterdam-North. It is relevant to note here that it was not the local population, but the commuting newcomers, who argued for a bridge across the IJ. Overhoeks, with its luxury homes, creative industries and cultural and tourist amenities is fuelling the redevelopment of the northern bank in a similar fashion and is successfully attracting the crowds to the other side of the IJ, causing major concern among the locals who fear the negative consequences of gentrification. These people treasure their village-like lifestyle, rely on the completion of the new North/South metro line to improve their connection with the rest of the city, and worry that a bridge will only bring in the hassles of the inner city. 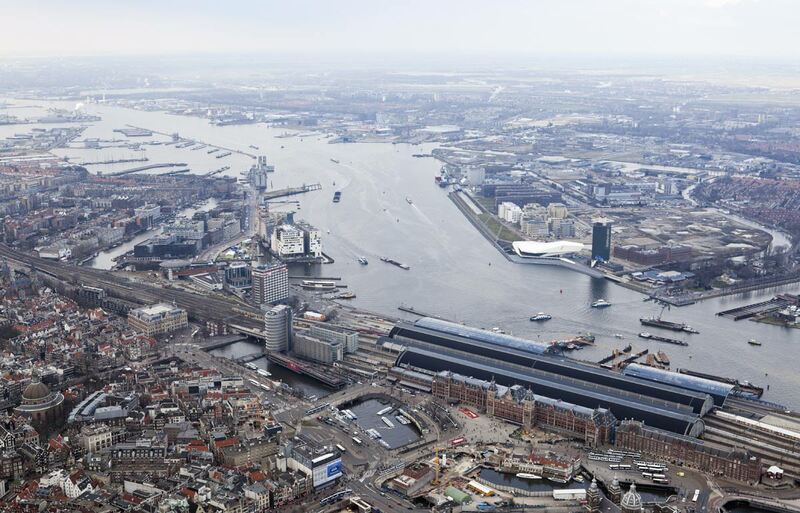 The rapid transformation of the former Shell terrain brought a new centrality to the IJ, which has been reinforced by the comprehensive renovation of the Central Station. Now that the station has two equally important front sides, the monumental nineteenth-century building facing the historical centre and a fundamentally modern new station hall facing the IJ, it is possible to experience Amsterdam from both sides of the river. However, as the chosen redevelopment strategy rested on the capitalisation of that same centrality/visuality, and led to the regrettable demolition of many modernist (industrial) buildings with cultural-historical value, it is also contributing to the loss of identity of a district long defined by its industrial heritage and social makeup. Sandra Guarda is a licentiate of Urban and Regional Planning from the University of Aveiro, holding an MA in Architectural History from the Vrije Universiteit Amsterdam. She works for an urban planning office in Amsterdam. I never realised that beautiful buildings were demolished for Overhoeks, because the area, former terrain of Shell was closed for public. So, I couldn't see much of it. Same as for others. It was not open for public and thus the buildings remained largely unknown. That made it even more easy to demolish them. Although...the former postoffice on the other side, east of the station was known and even then demolished...The investors and building companies only think of commercial gain, once more...And at that time modernist buildings were not much cared for. Even Monumental Care didn't protect them at the end of the century, in the nineties.